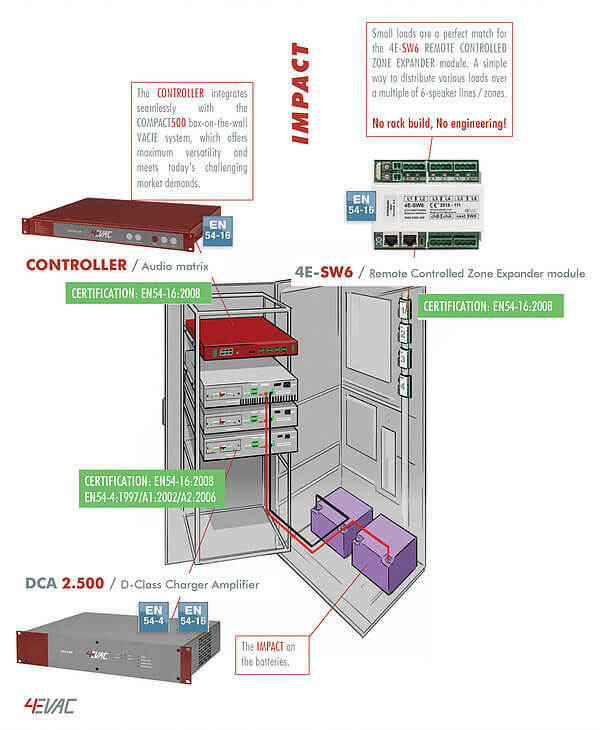 The IMPACT Voice Alarm System from 4EVAC consists of only two chassis, one controller that transfers the network data stream to the amplifier and a DCA-2.500 amplifier completed with at least one 4E-SW6 module. The 4E-SW6 is an intelligent 2-into-6 Remote Controlled Zone Expander and zoning module that subdivides broadcasts into a multiple of six sub-areas. The 4E-SW6 provides ‘built-in’ loudspeaker monitoring. Now it is time to think smart and combine battery charger capabilities with the integrated power amplifier. 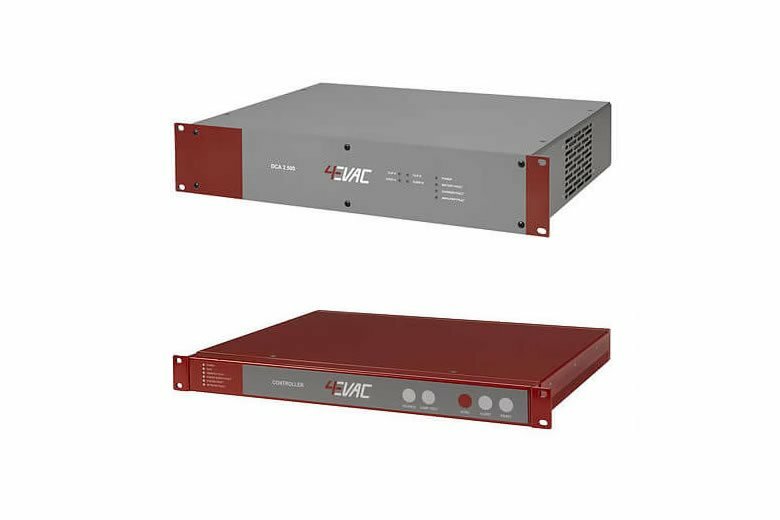 The DCA-2.500 amplifier not drives the system up to an impressive 1000 Watt, but it also charges and surveys a scalable battery pack for up to three 1000 Watt amplifiers. 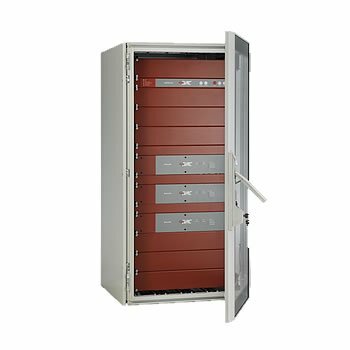 This not only reduces hardware and rack-space but most importantly, it decreases installation and operational costs whilst increasing reliability. Simple to configure with its easy to use GUI tool guiding software you create a systems solution with multiple Voice-Alarm zones, paging-zones and music areas in minutes. High quality DSP-processing guarantees state of the art audio performance throughout the building as well as highly intelligible pre-recorded and live message broadcast for both commercial and live-safety applications. IMPACT Voice Alarm System comes with a wide range of touchscreen emergency consoles, wall-box and desktop paging consoles. The Global Network connects up to 32 CONTROLLERS and over 200 paging consoles, GPIO modules and 4E-SW6 zone switching modules offering a staggering size of up to 1500 speaker-lines! Standing apart from any conventional power amplifier, the DCA2.500 features an in-built scalable battery charger with a temperature sensor that is EN54-4 compliant. Up to three DCA-2.500 amplifiers can be stacked together sharing a single battery pack, providing back-up power and recharging capabilities. The DCA-2.500 D-Class amplifier provides powerful audio amplification certified to EN54-16 and EN54-4. It delivers 2×500 W outputs and is housed in a 2U 19-inch rackhousing. The CONTROLLER is the heart of the IMPACT system. 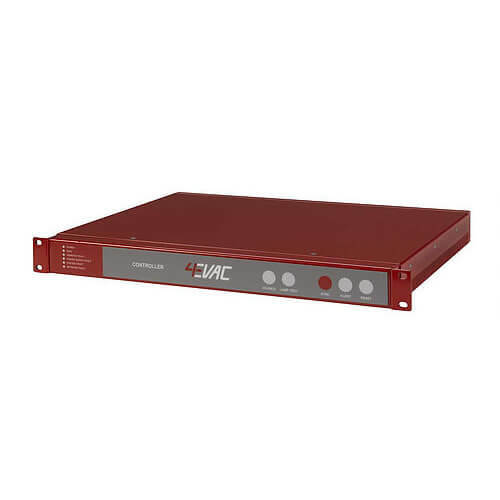 Housed in a 1U 19-inch rack-mountable frame, it manages all VACIE operations. This involves the management and prioritising of audio streams coming from the network. The CONTROLLER deals with inputs according to their own signal priority table, distributing the audio using the digital AMP-link module, which handles two prioritised streams through a dynamic assignment technique, to a maximum of 32 DCA-2.500 amplifiers. 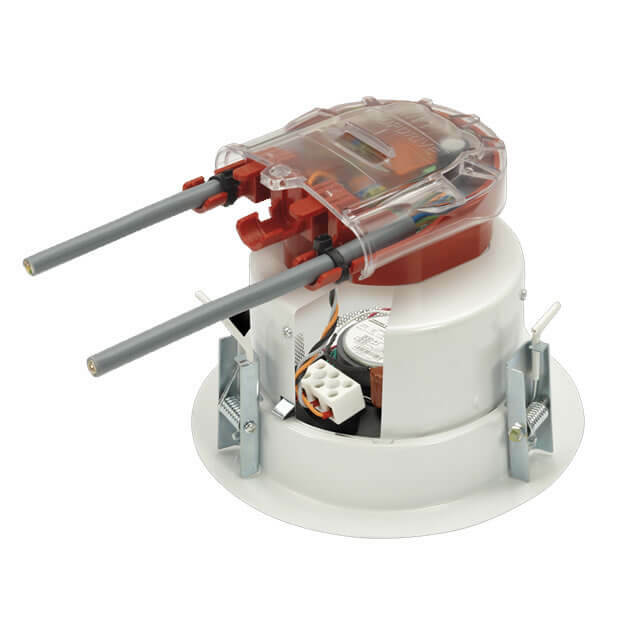 The 4E-SW6 Remote Controlled Zone Expander module is a simple and cost-effective way to distribute small message packets dynamically over multiple speaker-lines. 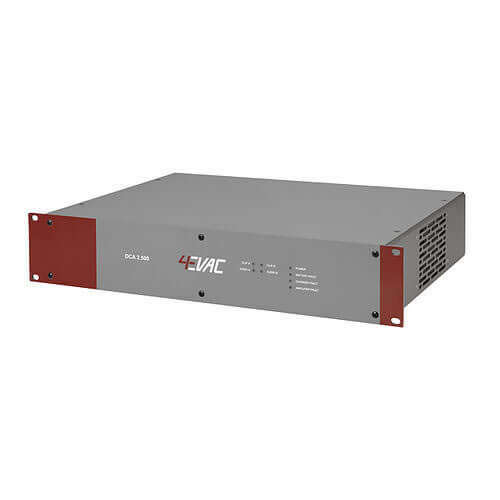 When combined with 4EVAC’s DCA-2.500, or other single high-power two-channel amplifier, the 4E-SW6 switching module generates simultaneous EVAC and ALERT announcements or paging messages and background music (BGM) into six switched speaker lines. By adding more 4E-SW6 switching modules it is possible to produce any multiple of six speaker lines. 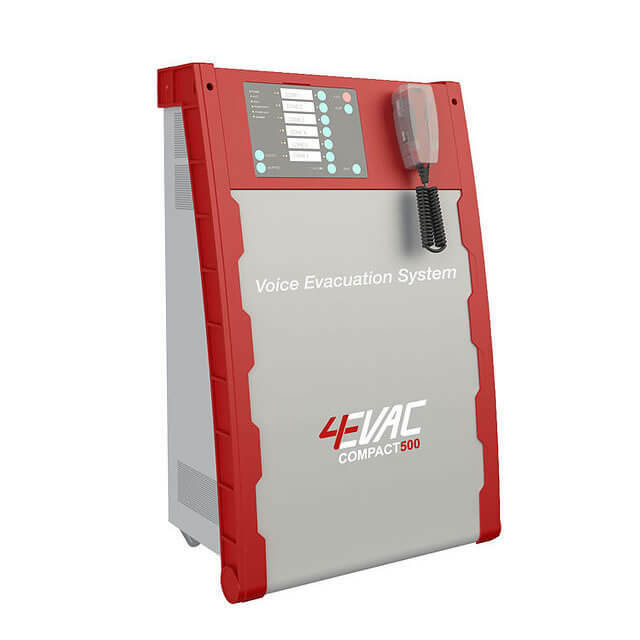 The 4EVAC series of paging consoles have been designed to provide a flexible user interface to the Compact 500 and IMPACT Voice Alarm systems. The console layout is clean and uncluttered, but contains all the system functions and status indication required by EN54-16. The handheld fireman’s microphone is protected by a transparent protection cover to provide access-level protection as well as protection against accidental operation. The handheld fireman’s microphone has a large speak bar and operation is both simple and intuitive.